Okay, so here’s a question I’ve long been pondering: what’s the difference between “cute” and “handsome”? I mean, which I hear the word “cute” I think of puppies and baby ducklings and the like; innocent, non-threatening balls of fluff, if you will. A teacup chiwawa, for example, is cute. Handsome, on the other hand, well that makes one thing of a big, good-looking German Shepard in comparison to that chiwawa. Or a guy with a chiseled jaw and bulging pecs wearing a plaid shirt and standing on a mountain top with an axe slung over his shoulder. I have no doubt that both are considered to be compliments, but they don’t seem to be synonyms. In fact, I checked the thesaurus, and “cute” doesn’t come up as a synonym for “handsome”. It’s hard not to think of it in the most basic of terms either: boys are “cute” whereas men are “handsome”. And women (well, at least most of the women I’ve ever known) are looking for “men” and not “boys” by the time they’re in the age of my dating pool. So what’s the difference? What’s the meaning when one term is chosen over the other? Well, you could put it in a little different perspective: How many times have you heard someone call a little boy “handsome” like when he’s dressed up for something? (I have lots of little boy cousins, so I’ve heard it a lot…) Obviously a little boy is not a man, but this doesn’t keep people from describing him as handsome. I consider “handsome” to be more of a formal description (but that’s just me). Like, if you are about to go out to a fancy dinner or other event and are dressed very nicely, then I would probably describe you as handsome instead of cute. Therefore, I think, with this theory, all men have the potential of being handsome. huh. My comment created a smiley face that I didn’t intend for. It was supposed to be an end parenthesis. Oh well. i offer a bit of a different explanation. In terms of the dating pool…cute is someone that I am attracted too. I think similar to Gabe. Put almost any guy in a suit and he’d be handsome. Funny thing is that I wouldn’t say all guys are cute out of the suit (clothed of course you bad thing!). Handsome = Tom Brady, thus, yes, unattainable. The men out of my league, if you will – celebrity or not. Though, when I refer to a guy as cute, I’m typically noticing that he has young(ish) looking features or appears very approachable, friendly. Since you mentioned it, care to explain the difference between calling a woman “cute/pretty” and calling her “beautiful”? Because, while I know I’m cute, I don’t think I fall into the beautiful category…reserved for the likes of Jenifer Aniston and such. I agree with the women who have commented above in regards to attainability when it comes to those words, but another thing I will mention: “Handsome” usually means that the man has met some standard (not necessarily a good standard) that society has decided to put in place. Men can be “handsome” but I’m not attracted to them. There are a number of movie stars who are considered handsome that, while I can appreciate that they meet this standard for looks, I wouldn’t want to date them. Cute, on the other hand, is subjective. There is no standard. everyone’s definition of cute is different. Cute denotes a likability and attraction. A German Shepard who is standing proudly next to his owner is handsome, but if his tongue is hanging out and he is bounding after a ball, he’s cute. Cute is quirky, cute is unique. Ugly things can be cute. Handsome things can be cute. I would actually prefer to be called cute rather than “Pretty” or “Beautiful” because cute immediately implies some sort of endearment whereas handsome doesn’t. See, I always think of “cute” in terms of behavior — and very few of the MEN I know act “cute” (cutely? ), although small children and animals do. I find when a bunch of women sit around talking about a “cute guy”, it’s kind of demeaning to the guy. I think of “cute” as being more about behavior and having to do with something or someone younger, and “handsome” as what the guys grow into. Or, in younger guys, “cute” is more about the fresh-faced, boy-next-door look AND demeanor (again, behavior rather than looks), whereas “handsome” is the more sculpted look that usually takes a heck of a lot more work! A friend of mine disagrees. She says the “cute” guy is the one who will treat you well, while the “handsome” one is the one who’s going to cheat! I guess everyone has his or her own definition! If I were you, I’d be pleased with the “cute” label. I think there is also a huge gender difference. Men see the word as demeaning whereas women see it as a compliment. I’d have to agree with Gabe. “Handsome” is mostly long the lines of being formal, I also think it’s an “old” word, I barely hear it anymore. Now, cute? I hear it all the time. Describing cats, guys, clothes, etc. It’s really not supposed to be demeaning, or calling a man a boy, or whatever. Just take the damn compliment and say thanks, heh. Just A Girl – So, it’s all about the suit, eh? Thanks for the compliment. Devonellington – Heh, I’m going to go with your friend’s description, if for no other reason than it makes me look good! Mel Heth – Having never been on a blind date (I know, weird, eh?) I wonder how the person setting me up would describe me? Lea – I wonder why? Being the great student of human behavior that I am, I’ll give you the definitive rundown. There are three levels of desirability in the feminine mind. 1) HANDSOME= You are a Samurai? Don’t act like a coward. Act like a Samurai and take me. 2) CUTE= He’s so soft and cuddly. Can I keep him? 3) A PROJECT= I could work with that. I think it depends on whether I’m talking TO someone or about someone. And how much I want them to know my real feelings. Someone is “cute” when I tell them to their face, because “handsome” is too serious and as I’m married, I can’t be hitting on guys in public. And if I tell a friend a guy is cute, it’s because I don’t want her to know how hot I think he is so I hafta play it low. Plus “handsome” is so formal. It’s how I describe movie stars because they are unknowable. Me thinks that handsome has more a sexual appeal, looks more manly, someone you want a relationship with. Whereas cute is childish looking, bringing joy, not having any sexual appeal. You can describe a pet as cute, a baby as cute, i.e not necessarily a relationship material. I agree with you Johny 100%. The first comment I see that really make sense. Perhaps you should post a photo and all the gals can tell you what ‘cute’ really means in terms of YOU? 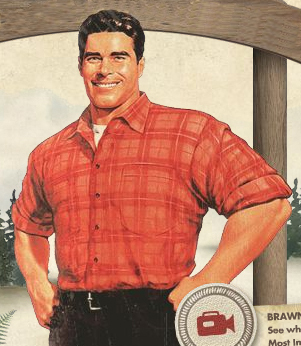 In the meantime, I’m gonna send the picture of the Brawny man to someone I know to tell him every time I see him in a plaid shirt I think of paper towels…that’s why I searched google image for brawny, linked to here and ended up perusing this blog for 15 minutes. I’ll take a hike now (yes I DID just pun) Lates! Handsome: A good-looking older man.